The lamp was a very intriguing object. After school Aru would spend some time looking at it and wondering what made it special and cursed. Aru’s mother had told her that according to legend, when the cursed lamp was lit the Sleeper would rise. He would wake up Lord Shiva, the God of Destruction who in turn would perform the dance to end the world. Her mother had warned her to never ever touch the lamp. Now, Aru was going to light it and break all the rules and disobey the warnings her mother had given her. Aru has flicked the lighter on and is about to light the lamp and then she hears a voice coming from the lamp that seems to be whispering her name. Putting it down to imagination she lights the lamp. Suddenly, the whole room is covered by a dark shadow that is speaking to her in a mocking voice. Terrified, Aru turns to her three classmates and finds that they are frozen in time. Her mother is also frozen. What she had thought was just lighting a lamp, turns out to be far worse. She, had woken up the Sleeper. She finds out about all of this, from a talking pigeon named ‘Subala’ nicknamed by Aru as ‘Boo’. Boo had come through a long tunnel that starts in the mouth of one of the elephant statues. Boo informs her that she has the soul of one of the five ‘Pandavas’. The souls of the Pandava brothers gets incarnated every lifetime in different bodies. Unfortunately, in this lifetime Aru is one of them. Boo then tells her that she has to find her other sibling who is also a Pandava. He or she would also be awake and not frozen in time like everyone else. Aru goes through the tunnel in the elephant statue’s mouth and finds her other sibling Mini. Unlike her, Mini knows a lot of things that Aru had just learnt. Mini knew that she was a Pandava and that they had to go stop the Sleeper. 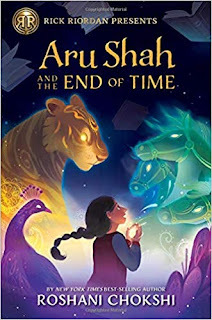 Along with Mini and Boo, Aru has to recover the hidden celestial weapons and find a way to stop and defeat the Sleeper before he reaches Lord Shiva. To do this they have to go into the Otherworld, find out which Pandavas they are and receive instructions from the Council of Guardians. Aru finds out that she is the daughter of Indra and has the soul of Arjuna. Mini is the daughter of Dharma raja and has the soul of Yudhishtira. Urvashi and Hanuman are two members of the Council and they till Aru and Mini that the only way to defeat the Sleeper was to look in the Pool of the Past that was in the Kingdom of Death. To reach here they needed to cross the Door of Death. There were three keys to unlock the Door of Death. They were the sprig of youth, the bite of adulthood and the sip of old age. They had only nine days to defeat the Sleeper and unfreeze everyone before it became permanent. This is how much of the book I can tell you about without bringing in spoilers. The book was very different from other books that I have read. It had a new plot that I had never read before. The characters of Aru and Mini were a mix of something that I had read before and something entirely new. Boo was my favourite character as he was really sarcastic and funny. I loved the part when Boo starts face planting himself in the grass, when he finds out that Aru and Mini are girl Pandavas. Boo also is very smug and amusing for a pigeon. Mini on the other hand is scared and doesn’t feel that she is fit to be a Pandava. She keeps on worrying that Aru and Bo will leave her and has many irrational fears. She adds humor to the book. Boo keeps on making sarcastic and ironic comments but Mini just doesn’t understand them. She interprets them for their literal meanings and then gives an answer which leads to another round of face planting by Boo. While most of the book was amazing, some parts were little awkward. For example, at the start of the book Aru is visited by her classmates. They see the statues of the Hindu Gods in the museum. All of them start mimicking the positions of the gods and make fun of them. Aru feels ashamed at the gods, she wishes that they were different. This shows that Aru is embarrassed that she has such gods. Another instance occurs when Aru learns about ‘karma’. Karma is an important part of Hindu culture as it determines what we will be born as, in our next life. Aru, however thinks that this is all nonsense and it makes her head spin. There are a few other instances like this were Aru feels embarrassed and slightly insults Hindus and the Hindu culture. These parts were little awkward, and I didn’t like them as I am a Hindu. Other than these parts, I loved the book. It is written very well and even if you start reading from between the book you will enjoy it.